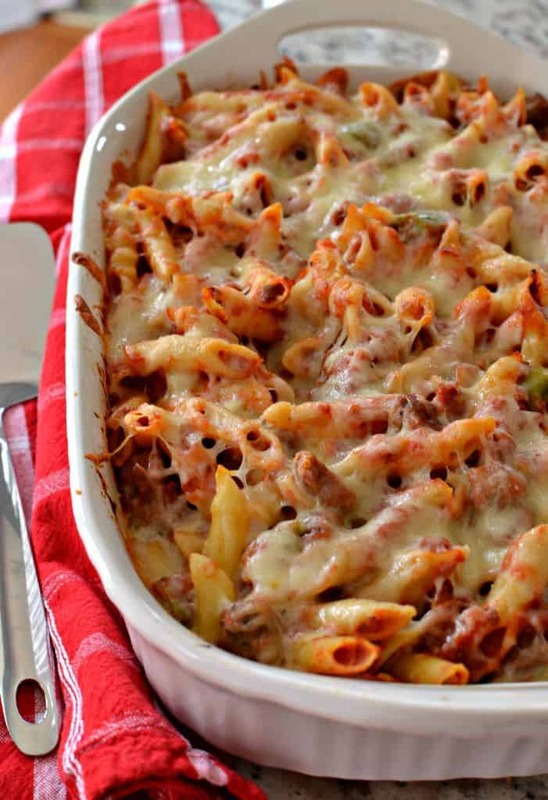 Baked Mostaccioli combines Italian sausage, peppers, garlic, onions and marinara. It is blanketed in mozzarella and provolone cheese. Guaranteed to please! Serve with Triple Cheese Garlic Bread and Italian Chopped Salad with Fresh Italian Dressing. First cook your mostaccioli noodles al dente according to package instructions and drain well. Meanwhile in a large skillet over medium heat brown the sausage. When almost completely browned add the green pepper and onions. Cook until the onions and green peppers begin to soften. Add the minced garlic and cook for one minute. Remove the pan from the heat and drain any excess grease. Combine the cooked sausage mixture, cooked mostacccioli, and marinara in a large casserole dish. Top with the grated Parmesan, shredded mozzarella and shredded Provolone. Bake about twenty five minutes or until the cheese is melted and very lightly browned. 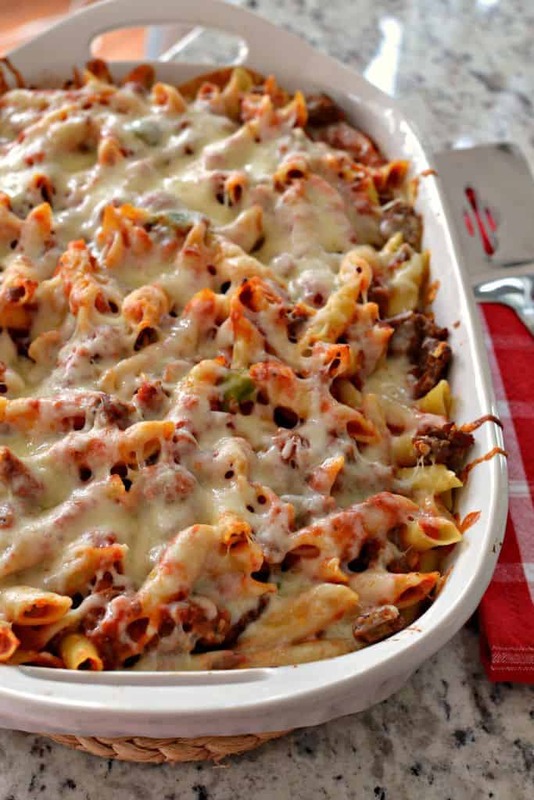 What to serve with Baked Mostaccioli. Helpful hints on making this Baked Mostaccioli epic. Cook the mostaccioli al dente which means still somewhat firm. As it will be baked for a bit with the sausage, veggies and sauce. Use good quality Italian sausage. Most butcher shops make their own consequently it tastes so much better than the processed sausage with all the preservatives in it. Chop the green pepper and onion fairly fine as you want a little bit of each in almost every bite. Use a high quality tasty marinara. They really have come a long way with jarred marinara. Some of them taste pretty darn good and do not have any preservatives in them. If at all possible grate and shred your cheese fresh from the block. That way you will not have preservatives, added enzymes and cellulose. 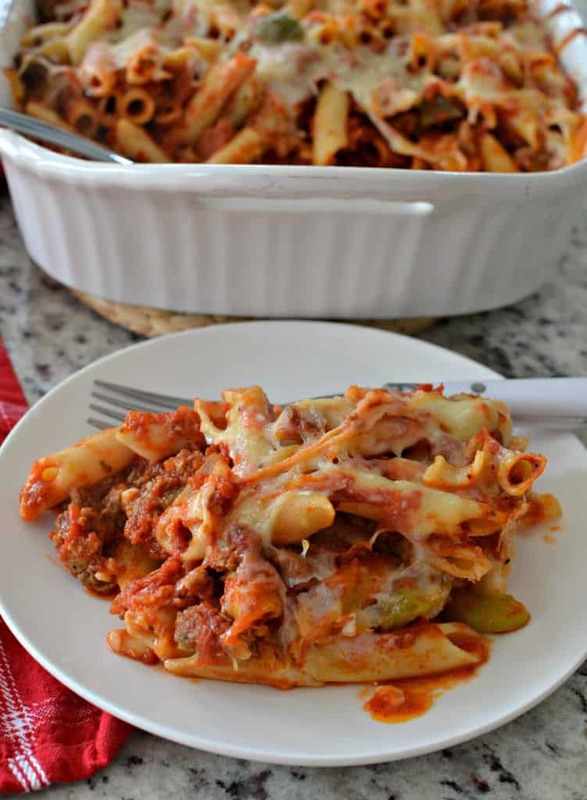 This hearty Baked Mostaccioli is simple, dependable, delicious and easy on the pocket book. Put the ingredients on your shopping list today! Make your family an awesome meal that you can feel good about today. Other pasta dishes you will love! This post was originally published July 21, 2015 and was republished November 29, 2018 with new content. Baked Mostaccioli with Italian sausage, sweet bell peppers, garlic, onions and marinara. It is blanketed in Parmesan, mozzarella and provolone cheese. Add peppers and onions to same skillet over medium high heat. Cook 3-5 minutes or until edges of onions start to brown. Add garlic and cook 1 additional minute. Remove from heat. Combine the cooked sausage mixture, cooked mostacccioli, and marinara in a large casserole dish. Salt and pepper to taste. Sprinkle with provel, mozzarella and parmesan. Bake at 350 degrees for 25-30 minutes or until cheese is melted and started to brown just a touch. Hello. It seems you forgot to mention what temperature to bake this dish at. I assumed 350 since that’s a typical number, but if there’s a specific number your recipe calls for it would be helpful to post that. Thanks for the heads up. I will correct that right away. I have to ask, while I love Jimmy dean sausage, not for this recipe … good Italian sausage … sweet or hot … would seem to work better with this flavor profile. I enjoy your recipes, thank you!!!! Hi Beth! I’m about ready to get started on this recipe in about 15 minutes! All the prep work has been done ahead of time. Marinara sauce made yesterday and all the cheeses shredded, onions, garlic and peppers chopped and bagged etc. One quick question if you wouldn’t mind. The photo’s seem to show the sausage chopped up finely – but it may be sliced. I’m uncertain. Do you slice or break-up the sausage? I understand that you’ll probably not be able to respond to this comment before I’m ready to start so I’m going ahead and breaking the sausage up in a large skillet and browning it that way. OH – one last thing – as Linda posted above, I’m using sweet Italian sausage. I’m sure this is gonna ROCK! I am so sorry about the delay. Yes you break up the sausage. Good call on your part. It sounds like you got it going on …good cooks everywhere. This pasta is perfect comfort food! The whole family loves it! Our whole house loves pasta recipes like this! It was a huge hit for dinner! My family enjoyed it! That is great! Glad that you liked it! I made this for dinner last night and it was a total hit! Thanks for sharing! The pleasure was all mine!We love this recipe too! One of my favorite meals! Easy to make and tastes great – the whole family loves it! Thanks Justine! I agree 100%! What a delicious looking dish! My family would love this for dinner one night this week, I will definitely be giving it a go. What a good dish to have with the family, am sure I can prepare this, the guide is easy to follow. Thanks. Another great recipe, Beth! This is making my mouth water just looking at the photos! This looks delicious! My husband (and my kids) would love this so much!! Thanks Shannon. I hope you try it. It is easy and delicious! 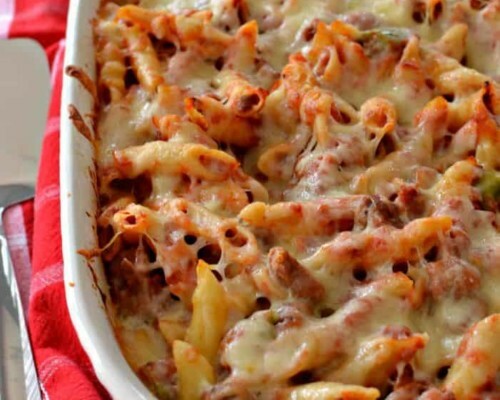 I’ve tried a lot of baked pasta recipes, but this has by far got to be the best. I love touch of Italian sausage. I substituted a veggie Italian sausage but I think it still gave it such a nice kick. Thanks for sharing this one. This recipe looks so delicious. We would love to try to make it ourselves. You really should try it. It is delicious and easy! This came right on time. I’ve been craving for pasta lately. I’ll have to make this one for the weekend. Thanks for sharing the recipe. My pleasure Criselle! I sure hope you enjoy it!! This looks absolutely scrumptious! I am a big Italian food lover and have this pinned and saved for next weeks menu!! Thanks so much Cecilia! I hope you love it as much as we do! Can anyone confirm the size of pan this fits in? I am guessing a 9 x 13? Sorry about the delay. Yes that is a 9 x 13. Oh, my, this looks so good!! We love pasta at our house, so I will be adding this to the menu! This is an amazing dish! Love everything about it. 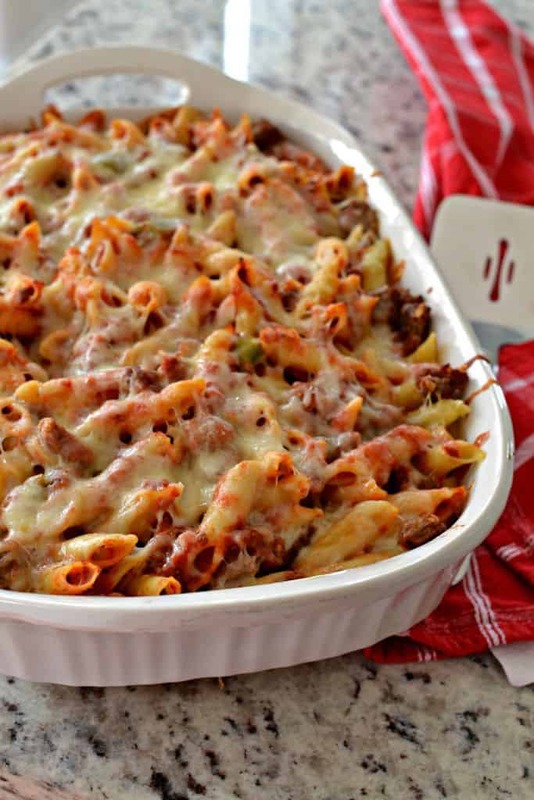 I’ve never heard of mostaccioli and will definitely try this! My family loved it! A new favorite for weeknights! This is the most perfect comfort food! LOVE it!